I have a lot of opinions on things that aren’t just books. However, I don’t feel even slightly competent enough to do full reviews on them, so I’m going to use this as a massive dumping ground for my thoughts. Wasn’t so great. The music was awesome, the actors were great, and the tone of the movie was what I had in mind, it just felt very superficial. Maybe that was the point, but it definitely felt like a movie told from Gatsby’s perspective rather than that of Nick’s. The entire thing felt very over-romanticised and Daisy was held up as this perfect, lovable character, whereas when I read the book, I absolutely despised her. And the entire lurking corruption through this broken façade of the American Dream never really came through to me, though maybe that was the director’s intention. Also, the visuals really weren’t my type of movie. They were pretty, but far too loud and in-your-face, that after a while, it actually got tiring. I found myself checking the time halfway through. On the plus side, I have found that I could quote most of the movie. They stayed quite true in terms of dialogue, usually having it word-for-word, and you can’t dismiss the poetry of F Scott Fitzgerald’s writing. I don’t think I can really give these ratings, because I have no idea what I’m doing right now. I’ll say, watch it if you want, because it’s fun and bright and colourful and the soundtrack is awesome, but just remember it might feel slightly off as an interpretation. The script was a lot better than I expected it to be, the acting was very good, and I really enjoyed it. 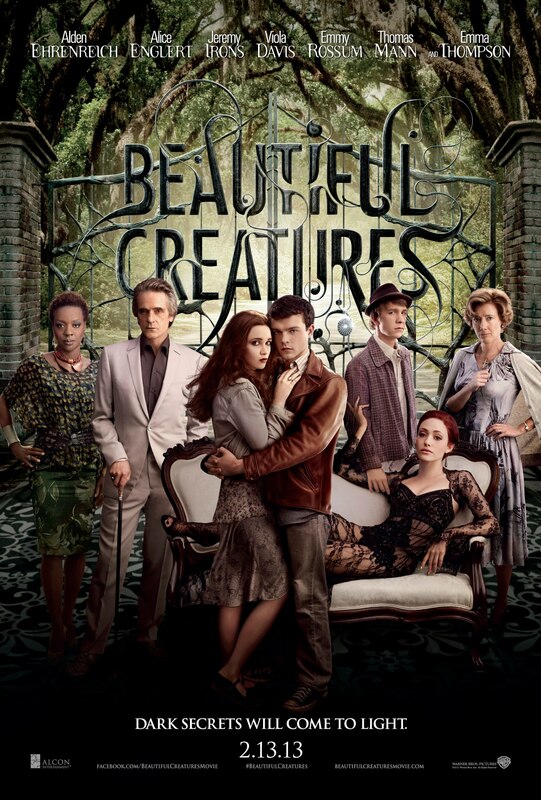 If you liked Beautiful Creatures, you will love this, so you should watch it. And if you aren’t, you should watch it anyway because it’s a really enjoyable film. And this is where YA Fiction goes to die. Saoirse Ronan is a good actress. I have not seen much with her in it, but what I have seen, I’ve liked. I know she can act. I’m sure everyone in this cast can act. The problem is, the script is abysmal. And her role, in particular, is hard as all hell. The reason I really liked The Host by Stephenie Meyer is not because I swooned at the romance. It’s not because I fell in love with all the characters and I wanted to marry all the guys and just wished that I could have a Jared for myself. In the book it questioned morality, the violence of humanity, survival of the fittest, loyalty to your own kind, and above all: the importance of family and friends. My favourite relationship was the friendship of Melanie and Wanda. But the movie took out all the parts I liked about The Host, and left all the Cons that I would have been happy without. They took out all the backstories of the different planets, including the people gradually becoming closer and closer to Wanda through their curiosity. They got rid of Wanda becoming more sarcastic and cynical due to spending too much time with Melanie. No Walter. No football match. Nothing but the overbearing love triangle, which might have pleased other fans, but made me groan in despair. Also, separate point: when showcasing Melanie and Jared’s relationship, they never had a conversation that didn’t lead to making out. That’s fine watching it the first time, but after that it becomes tiresome and makes their relationship seem oh so very empty. And oh the characterisation was bland. And the dialogue was awkward. And the internal conversations were not done well. I enjoyed it most of the time. Though I’m not sure whether I was just forcing myself to like it or not. Or maybe it’s because I’ve forgotten most of what happens in the book, and the more I remember, the more I realise they left out. The acting was a lot more awkward than I expected it to be, though I think that may be the fault of the extremely cheesy script. The visuals were pretty, and the humour was pretty fun, but they did forget a lot. And if you’ve seen it, you’ll know. The characters had very little personality, they cut out a lot of interactions with minor characters at the camp, and the voice overs felt unnecessary. Also, the battle at the end. With Kronos. I do not remember that happening. Ever. All of this would be fine if I didn’t know there were 3 more books, and that these scenes and interactions would be very important later. It means they might have to cut the whole Silena & Beckendorf arc in the Last Olympian, because she was on the ship and they saw her. Plus Beckendorf doesn’t actually exist yet. The romance between Annabeth and Luke has no weight, because all that was cut, and the Percabeth romance is kind of pathetic at the moment. Ok, good points: Nathan Fillion (Hermes) & Stanley Tucci (Dionysus). 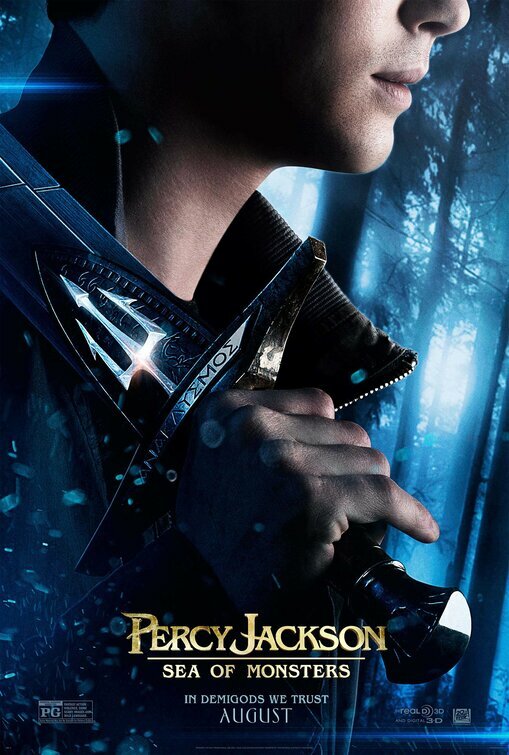 So watch it if you like Percy Jackson, and if you can stand a lot of major plot changes. Well, that was fun! There are so many book-to-movie adaptations coming out soon, that this may just be the first of many. But who knows. We’ll see. The second HoH news of the day! Quite honestly, I prefer the american cover. This one, while cool, looks very… cheap. I don’t know how else to put it. The other was this lovely artwork with awesome depth and tone to the colour and equally creepy and it just looked really awesome. However, this cover looks, quite honestly, like someone just photoshopped some random people onto a really cool picture. If it had just been the massive dude with the helmet, and then maybe made the cover a lot darker, a lot creeper, I would have liked it. Still not as much as the American cover, but I still would have liked it. But the two people underneath with tiny swords and perfect hair and clean clothes look very out of place, and very very fake. I’m very excited, obviously, for what all this means, but I wish they’d gone more of the arty route like the American covers did. The American cover has so much more emotion and depth and fear, whereas this one looks quite posed. So there is your HoH second piece of fun today! After waiting half an hour for the cover to be revealed on NPR Backseat Bookclub’s Twitter, I finally find the cover. On tumblr, no less. Not an official tumblr, or a book famous tumblr, just a random tumblr with some clever guy/girl who found it. Which means I really hope this is the official cover, otherwise this is going to be kind of embarrassing. Well, It’s Percy and Annabeth running through hell. How fun. It’s awesome and epic and everything you’d expect from a Percy Jackson cover! The only link so far that I can find to this in good quality is on tumblr, so here. Let’s hope it doesn’t get taken down and we don’t have to watch the terrible quality ones instead. Can you get copyright claim on tumblr? I have no idea. Then again the lightning thief trailer looked accurate, and we all saw how that turned out. But Annabeth is blonde! And Thalia and Tyson both look great! And Hippocampi! So I can keeping that hope that it will be good. I don’t know what else to say about it. My brain is kind of dead right now; I really should leave this review to a time when I can think coherently, but you know what, I’m going to publish it anyway, because I’m a rebel and I publish two blog posts within a few minutes of each other, even if the Sea of Monsters trailer has been out for a while, I just completely forgot to review it. And this isn’t really a review, more like a GO WATCH THE TRAILER, type of thing, so yeah, you should go watch the trailer, and raising awareness that it exists because if you haven’t got a tumblr, there is a high chance that you don’t know about it. I’ll come back and edit this with some coherent thoughts later, when I can actually think straight. IT’S OUT IT’S OUT IT’S OUT!!!!! I’m leaving it big so that you can see it and all, since most sites have it tiny. 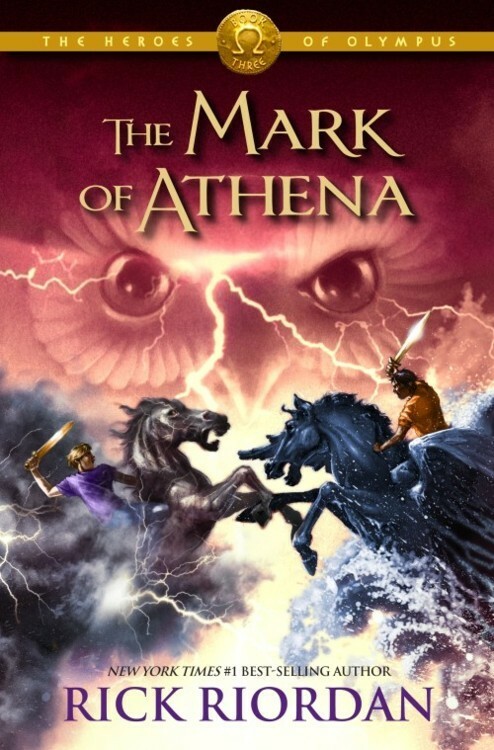 There’s an owl in the background (the mark of athena), and Jason and Percy are obviously having some epic battle of lightning vs. water and it’s all epic and stuff. Percy is on Blackjack? No idea which horse Jason has. Why are they fighting? Please leave suggestions, because I have no idea and I really want to know. So Rick Riordan read out some of the first chapter at his events promoting the last Kane Chronicles book (A series I still need to read), and it ended BEFORE ANNABETH MET PERCY. But now there’s a new one that I think is the entire chapter. So, in this extract (oh, spoilers) Annabeth sees his face. For like a second. And that’s enough to make me happy for today. I still need the book as badly as before, but this makes up for it a bit. For those of you who can’t find where to read it, here’s a link. I’m really hoping this means Annabeth is one of the seven. But I’m really scared that she isn’t. Please, please, please be one of the seven. Oh, and, for those of you who haven’t seen it, here’s the summary. “In The Son of Neptune, Percy, Hazel, and Frank met in Camp Jupiter, the Roman equivalent of Camp Halfblood, and traveled to the land beyond the gods to complete a dangerous quest. The third book in the Heroes of Olympus series will unite them with Jason, Piper, and Leo. But they number only six—who will complete the Prophecy of Seven? See, I’m pretty sure it’s going to be someone new that joins the seven, BUT I WANT IT TO BE ANNABETH. It has to be Annabeth. Please make it Annabeth. Mark of Athena seems like it’s going to be awesome. It’s Rick Riordan, I wouldn’t expect any less of him. No, not awesome. EPIC. So… now that my rant is over… I can properly introduce this book! 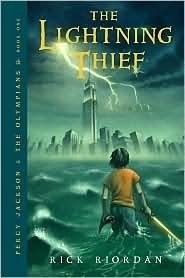 This is the first book in the Percy Jackson, series, who is the main character! (hint that the series is named after him! ), by Rick Riordan. 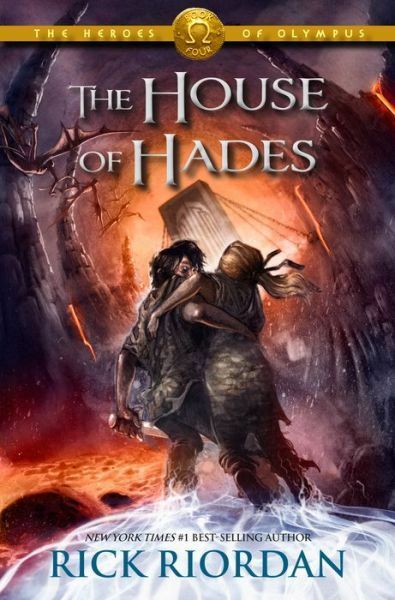 It is the first book of five, and it links to another series, called the Heroes of Olympus! (which is definitely, hopefully, a YA novel!). It was just so original and the writing style was flawless! It was just so full of humour, but the writer knew when to put in serious notes, it was just done PERFECTLY! They were just so likeable! Even the evil girl, Clarisse! She was just so funny… :D, They were just so 3D! Amazing! Remember the main message from this review: THIS BOOK ISN’T JUST FOR KIDS! AND IT CAN NEVER BE CLASSIFIED AS A “KIDS” BOOK (because that means that it can only be for kids…). So, if you read this review, and didn’t just skip to the end (like what I do with books :D), you can probably tell that this is a 5 shuriken star book! I would seriously recommend this book!